You’ll find this feature by Control-Clicking on the Combinator interface. At the bottom of the list you’ll see Select Backdrop. Gotta have a MPC Renaissance Backdrop. This is a really nice idea! I would just leave out non-functional controls like the tab buttons on Massive, though. Some of these backdrops are amazing! nice work. fieldframe wrote: This is a really nice idea! I would just leave out non-functional controls like the tab buttons on Massive, though. Thanks. Those intentionally get covered by Combinator's patch browser. I only put them there for artistic expression. Creativemind wrote: Some of these backdrops are amazing! nice work. esselfortium wrote: Nice, though the previews are a bit misleading since the custom knobs and buttons will be overwritten with the stock combinator ones. This has probably been suggested before, but it would be awesome if Propellerhead supported using the RE SDK to make custom Combinator front-ends. Ooh, that would be fantastic actually! Not dumb and thanks for asking! Hey Richard! Unrelated to this thread but thought I'd ask - it's been a year and 1/2 since Dune 2.5 came out. Are there any plans for a Dune update anytime this year? Love that synth! is there a synth master one and two combinator skin ??? EnochLight wrote: Hey Richard! Unrelated to this thread but thought I'd ask - it's been a year and 1/2 since Dune 2.5 came out. Are there any plans for a Dune update anytime this year? Love that synth! At some point DUNE 3, though I cannot say when yet, it's a big project If we update DUNE 2 it will probably be a maintenance update. Fantastic news! 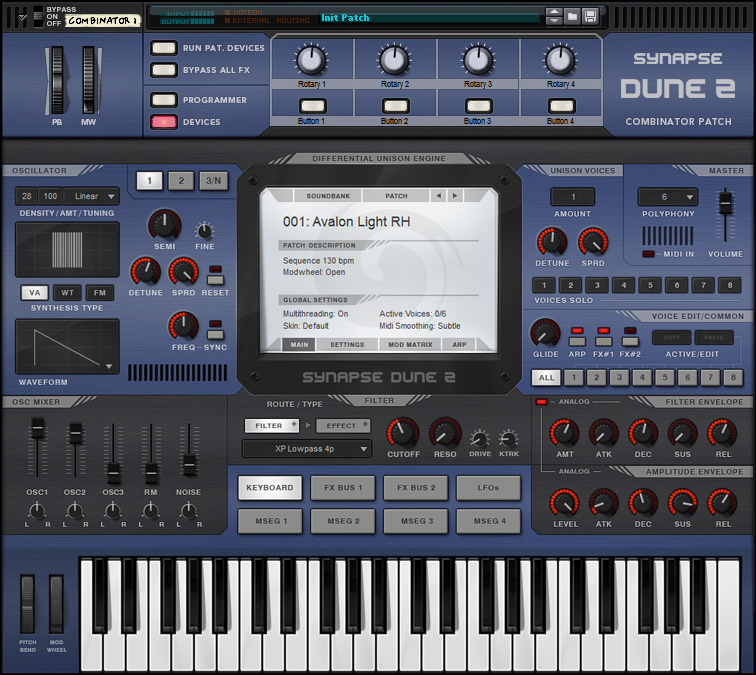 And let me mention - having Dune 2 in Reason is simply awesome. One of my favorite synths and easily up there with Serum, Spire and VPS Avenger! I can only see the Synapse Audio backdrops! Where can I download the others mentioned on this forum ? mgagne01 wrote: I can only see the Synapse Audio backdrops! Where can I download the others mentioned on this forum ? I haven't provided a link to download the others yet. I will soon though as there will be a first round of images which is almost ready. Stay tuned. I can't seem to vote on the list at the top but I would vote for several of them. A couple of notable missing entries, IMHO, would be Ezdrummer and Absynth (NI). Also you have Waldorf but I'd like to see a specific entry for PPG. But overall this is a Great idea! Much needed. FXpansion have been longtime friends of Reason. I think backdrops for Strobe2, BFD3, and Geist2 are in order. raymondh wrote: I'm really enjoying Sonic Projects OP-X! A skin for that would be great! The OP-X Pro II is like... the best VA synth ever created! I love this synth, it's fantastic!